CLAUDE HELLER (Mexico) said the challenges currently confronting the international community included the continuation of impunity in the Democratic Republic of Congo, the reconstruction of Haiti following the earthquake that had ravaged that country, and conflict in the Middles East. Specifically on that point, he said that, despite 60 years of conflict, there was new hope for peace in the Middle East with the resumption of direct talks between the Israeli and Palestinian sides. Mexico believed that the creation of a politically and economically viable Palestinian State living side by side with a secure Israel was an essential condition for lasting peace in that region. In that regard, his country welcomed the efforts of United States President Barack Obama to achieve that goal. Noting that hope for a definitive agreement had been marred in the past by extremist forces that sought to derail the peace process, he said that the parties had a historic duty to reach an agreement and expressed the hope that they were up to the challenge. 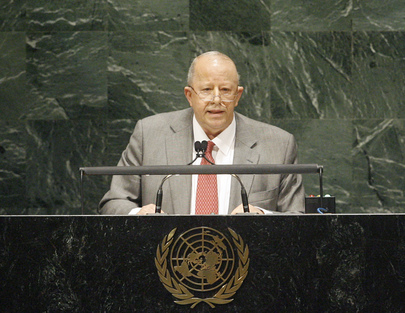 Mexico pledged the support of States that were genuinely committed to peace. On nuclear disarmament, he noted the significant progress achieved in 2010 with the signing of the strategic arms limitation agreement between the United States and the Russian Federation, the Nuclear Security Summit convened in Washington, D.C., and the Review Conference of the Treaty on the Non-Proliferation of Nuclear Weapons. Those achievements deserved to be commended. The creation of a nuclear-weapon-free zone in the Middle East would be an important contribution towards advancing to a nuclear-weapon-free world. He went on to say that the consequences of the economic and financial crisis resulting from the failure in regulatory systems had been suffered worldwide. The failure that had led to that situation must be addressed. The crisis had demonstrated the need to promote international cooperation schemes to tackle such challenges. While Mexico commended the positive work done by the G-20 in that regard, it believed that the United Nations should play more prominent role in such matters. That was why Mexico supported the relevant objectives set out by the President of the General Assembly. In addition to traditional challenges, the international community faced new challenges, he went on. Terrorism and globalization of the drug trade posed new threats to global peace and security that endangered States and regions. Those threats were not the responsibility of particular countries or regions, but needed to be addressed jointly by the international community. Mexico had fully confronted the challenges posed by drug trafficking. That fight required increased investment of resources, he said, stressing that the cost was high, but it would be even higher if State authorities did not confront the attendant impunity.